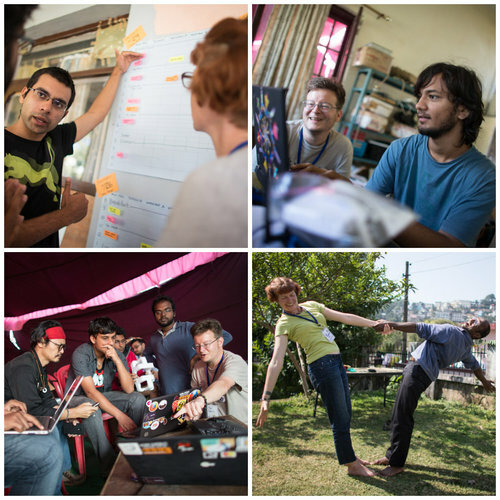 Tod & I just returned from Hillhacks, a tech conference for "hacking and making" in the Himalayas. It was an incredible experience for both of us. Dreams came true, doors opened, and plans formed. But I am getting ahead of the story. Ironically, the one thing that didn't happen on this trip is what took me there in the first place. Akiba and I had planned to get Maru the LED hoop working in time for a Diwali performance, but thanks to my inability to stabilse the power system and a lack of time to focus on the work needed, it didn't happen. What was I doing, if not the project I'd planned? Mostly I was teaching and hosting school students who attended our workshops. At Woodwhistlers: a new circus star; physical math; magnets; making music. At Woodwhistlers primary school in Naddi, we had two full days of programs. We constructed an improvised orchestra, did Chisanbop finger abacus, made electronic instruments with our bodies, learned to draw maps, played circus games and juggled, and discovered electromagnets. These kids were so enthusiastic and curious. They wanted to stay in at lunch to finish graphing their electromagnet experiment results. The kids in math class were jumping up and down to share their answers. At the end of the second day, the entire school of 30 students decided to stay late so we could finish a circus game. Akiba, Tod, Arun & I taught the classes and along with David Huang, whose photos illustrate this article, and Malik, our event videographer, we all fell in love with Woodwhistlers. Scenes from TCV programs: explaining some of the Arduino details; greeting the students; Akiba and the soldering stations; manmade webpage; Tod teaching Tails; hula hooping break on the lawn. 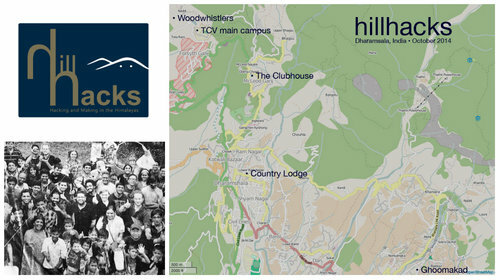 One school came a long way to be at Hillhacks. Twenty high school students from the TCV (Tibetan Childrens' Village) science magnet in Dehradun, about 12 hours away by bus, joined us for six days. 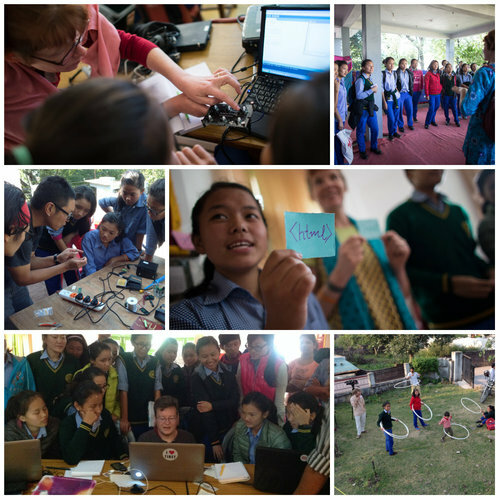 We lined up workshops ranging from WordPress to solar lantern construction, Tails OS, classic paper ciphering and frequency analysis, hands-on web, Python programming, Raspberry Pi, a portable science lab, Arduino, 3D printing...it was so much I can't even remember it all. And of course, hula hoops were available during breaks. 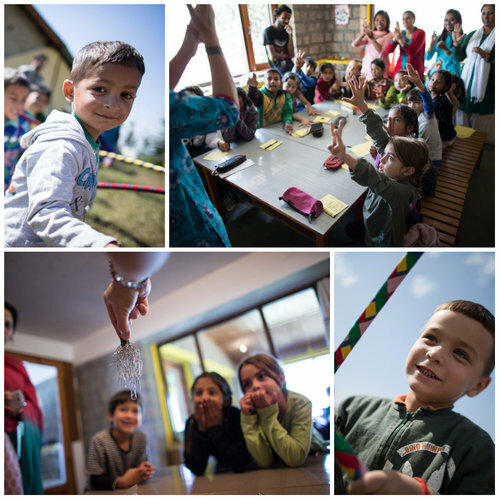 We also hosted a handful of kids from Rakkar, the village where many of the Hillhacks organisers live. They got to make solar lanterns, try science experiments, do circus games, and create a puppet show with filmmaker C K Low from Singapore. In between all the student activities, I kept myself busy making signs, organising things, and helping out in general. We started our time in Rakkar at the Ghoomakad guest house, then moved to Country Lodge in Ram Nagar (lower Dharamsala) for the main event. Tod was a member of the networking team that managed to have WiFi available for all the participants in both places. Diwali performances: fire dance; The Frolicaholics' India debut. Before we knew it, the student time was drawing to a close and Diwali was happening. Diwali is the festival of lights that combines Christmas, New Year, and Independence Day with presents, sweets and a lot of fireworks. Since Maru wasn't happening, I offered to lead a fire performance if I could find some brave volunteers. A dozen people raised their hands and we did a performance with palm candles. Actually, we did two, one choreographed in two lines and another one freestyle to one of my favorite songs, Fireflies by Owl City. Some new firebugs were born that night judging from the fire in everyone's eyes. The Frolicaholics performed on the musical open stage, too. During the conference: Shreyas and the schedule; Tod & Kondi in the NOC; Tod in a flash talk; me and Cherry giggle/stretching. The remainder of the conference was great. Shreyas kept the schedule and I helped to MC. My voice carries over almost all conversation and I got drafted to announce upcoming sessions, meals and tea breaks. There were many talks that I enjoyed, including a keynote by Tod on the last day and some extremely interesting presentations on technology and art. I gave a "talk" on Stretching for Geeks that was well received. ...and after the conference, Tod & I started dreaming. The people we met were inspiring, creative, and doing fascinating things all over India. Tod is ready to get back into actively hacking and making again. What if we came back for a while and worked on some of our own projects or collaborated on whatever ideas were floating around? Ghoomakad in Rakkar is a perfect retreat from the hustle of Tokyo and Akiba is hoping to start up a Hackerspace in upper Dharamsala next year so we'd have multiple options for participation. I discovered that there's a local interest in circus, so now I am dreaming of a modest community circus school. An on our last day, I met someone wonderful who can guide me in getting this done. I think India could be a very happy place for us to spend some time.